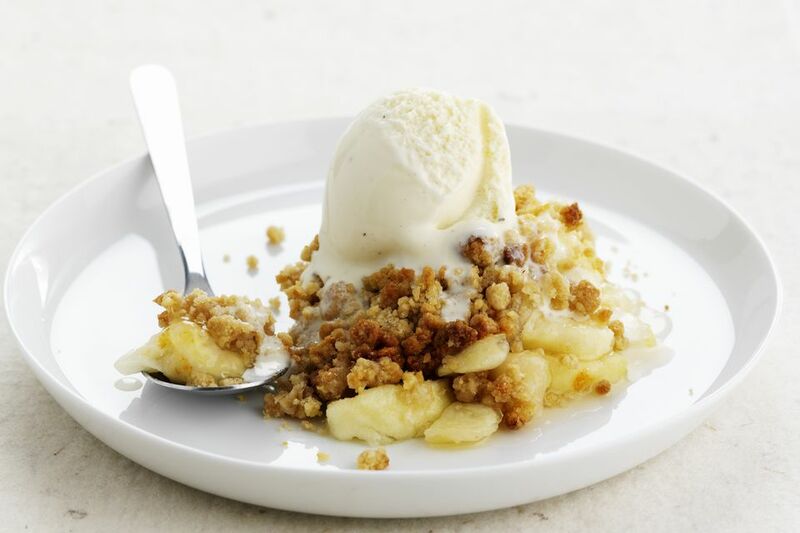 Serve this scrumptious apple crisp with ice cream or whipped topping for an extra special dessert. The recipe is a basic one, and it can be made with many different variations. I like to add cranberries to it around the holidays, and I always use brown sugar in the topping. If you're looking for smaller crisp, bake this apple crisp for two. If you like loads of crispy oat topping, this apple crisp is an excellent choice. Butter an 8-inch square baking dish. In a large bowl, toss the apple slices with the lemon juice, the brown sugar, 2 tablespoons of flour, and the cinnamon and nutmeg; arrange in the prepared baking dish. In a medium bowl, combine the granulated sugar, 1/2 cup flour, and the oats; stir in melted butter. Spread to topping mixture over the apples. Bake in the preheated oven for 30 minutes, or until apples are tender and top is nicely browned. Serve warm or cooled with ice cream or whipped cream (see below). Store leftovers in the refrigerator. To reheat, place it in a baking dish and heat in a preheated 350 F oven. Make the topping with 1/3 cup of brown sugar instead of granulated sugar. Add about 1/2 cup of dried cranberries or raisins to the filling. Add 1 to 1 1/2 cups of fresh chopped cranberries. Add 1/4 teaspoon of ground cinnamon to the topping crumbs. Use half apples and half pears in the crisp, or make the filling will all sliced pears. Add about 1/4 cup of chopped pecans, walnuts, or hazelnuts to the crumb topping. Serve the crisp with homemade or purchased caramel sauce for drizzling. Sweetened Whipped Cream, Vanilla or Maple: Beat 1/2 cup of cold whipping cream until soft peaks form. Add 2 tablespoons of confectioners' sugar and 1 teaspoon of vanilla extract or 2 tablespoons of maple syrup. Continue beating until it holds stiff peaks.